2017 Motorino XMr. Picture credits - Motorino. Submit more pictures. Motorino XMr is the first bike in our collection that brings a different flavor to our Motorino selection. It encompasses the utility of a scooter with the modern styling and more enjoyable handling capabilities of a motorcycle. The full size front suspension and the softness of the rear monoshock suspension contribute to a comfortable ride even on rough terrain. The 72V/20AH battery at the bottom of the bike provides lower center of gravity. Price as new (MSRP): US$ 2690. Prices depend on country, taxes, accessories, etc. Frame type: High-tensile steel frame. Comments: Charging time 7.5hrs with various options. 72V 20A-h sealed lead-acid main battery. Optional 72V 24Ah Lithium Ion (LiFePO4) battery. Regenerative breaking. Built-in vibration sensitive alarm system with two remote controls. Steering Lock. Sold mainly in Canada. Ask questions Join the 17 Motorino XMr discussion group or the general Motorino discussion group. Bikez.biz has an efficient motorcycle classifieds. Ads are free. Click here to sell a used 2017 Motorino XMr or advertise any other MC for sale. 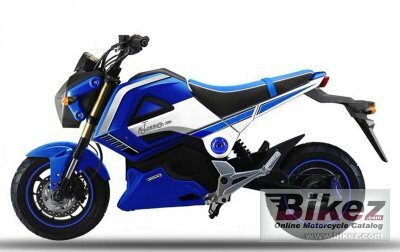 You can list all 2017 Motorino XMr available and also sign up for e-mail notification when such mopeds are advertised in the future. Bikez has a high number of users looking for used bikes. Before you buy this bike, you should view the list of related motorbikes Compare technical specs. Look at photos. And check out the rating of the moped's engine performance, repair costs, etc.